By the time that Maple and I arrived at our starting point, it was already noon, and finding a parking space was difficult. 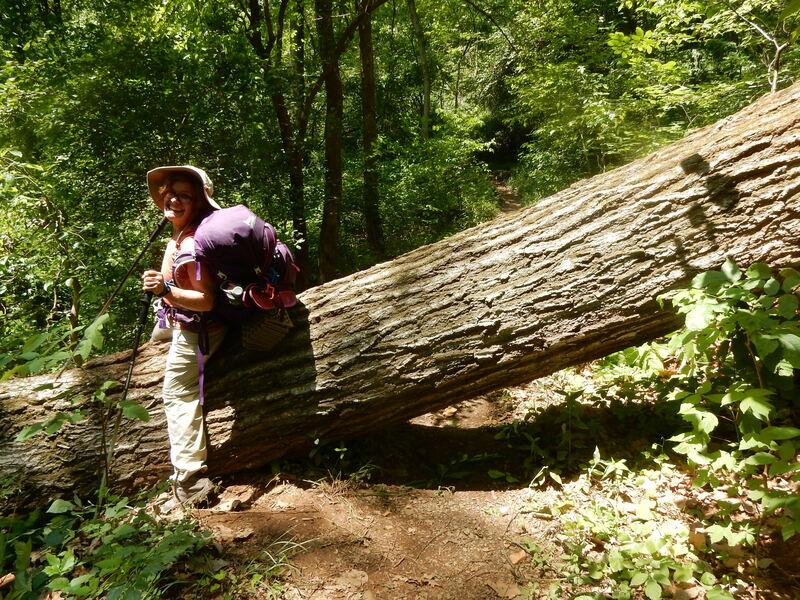 After all, it was Memorial Day weekend, the sun was out after weeks of rain, and if other folks’ hiking-boots were at all like mine, they were itching to get back out on the trail. The trail from Rockfish Gap to the Paul C. Wolfe Shelter, five miles southward, is about as smooth and as gentle as the A.T. ever is. 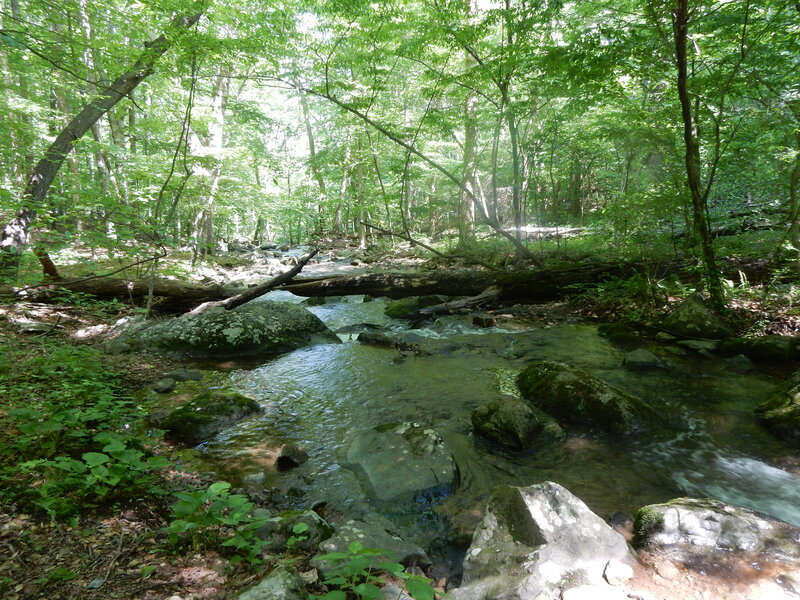 It crosses half a dozen shallow creeks and springs, so water is plentiful. After several weeks of rain, the forest was looking a little like a rain-forest, the vegetation had become so abundant, lush, and green. 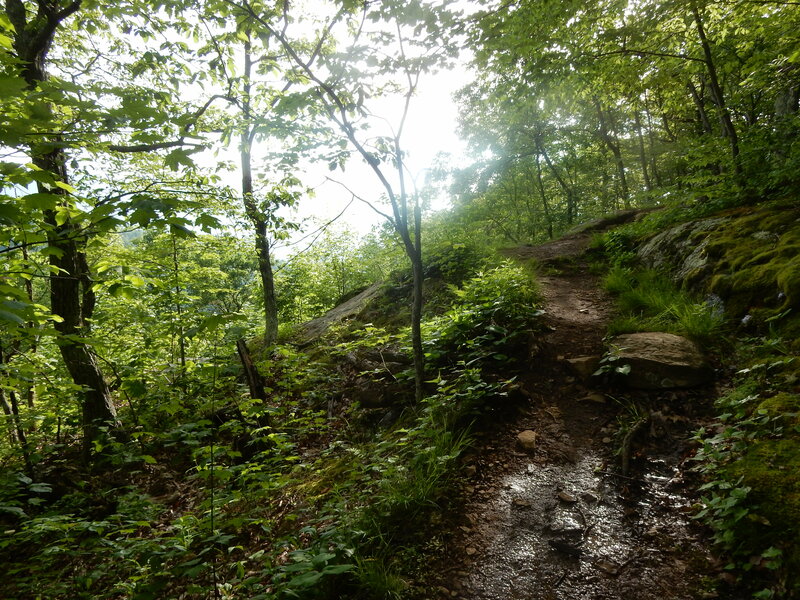 Ultimately, the trail becomes a series of downhill switchbacks, leading to the shelter and the rushing stream below. 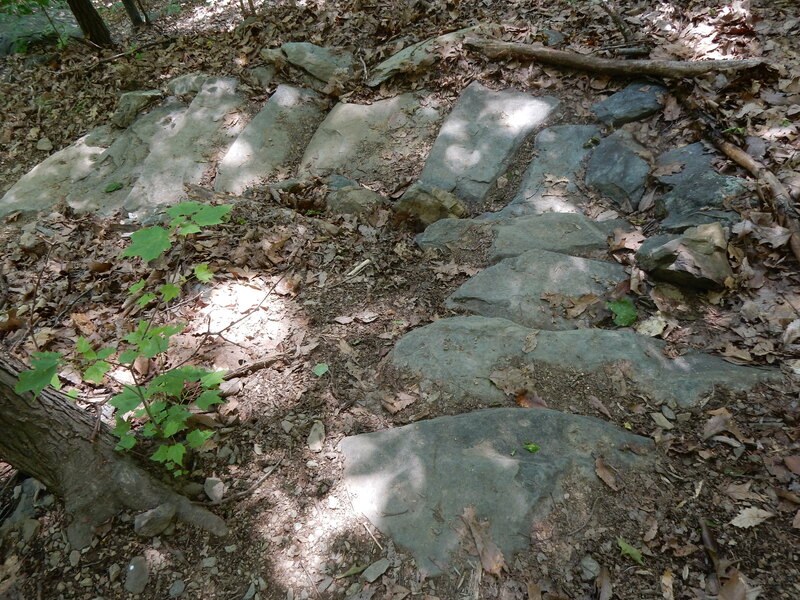 The Old Dominion Appalachian Trail Club has done excellent work here, building a series of stone steps at each turn of the switchbacks. The setting of the shelter could not have been better chosen, and it was clearly a popular camping spot. Maple and I picked a tent-site just a few feet from the stream, amid trees, and by a fire-pit. Throughout the night, we could hear the water running past us. If I have any complaint—and I have none that would be sufficient to keep me from this shelter—-it would have to be the infestation of ticks. Maple and I pulled five off of us during the evening, and I found one embedded in my leg the following day. That next day was almost entirely uphill, but the switchbacks made the hiking less strenuous and consistent, if longer. 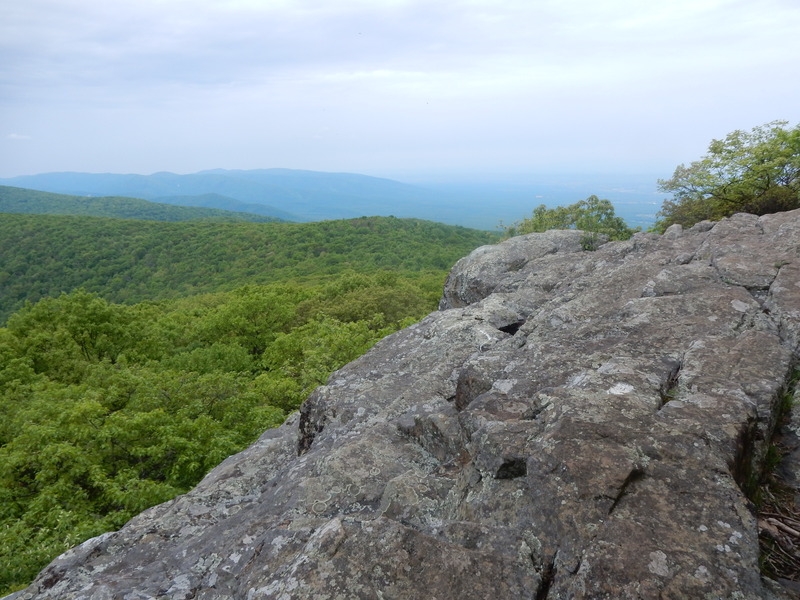 We were never really sure when we got to the top of Humpback Mountain; at the top there was a gradual decreasing of ups and a gradual increase of downs, but no peak on which to hang our hats while we shouted our victory. Although we had other hikers warn us about a cub and a rattler on the trail, we saw neither. What we did see was just how beautiful and majestic the Blue Ridge Mountains could be. 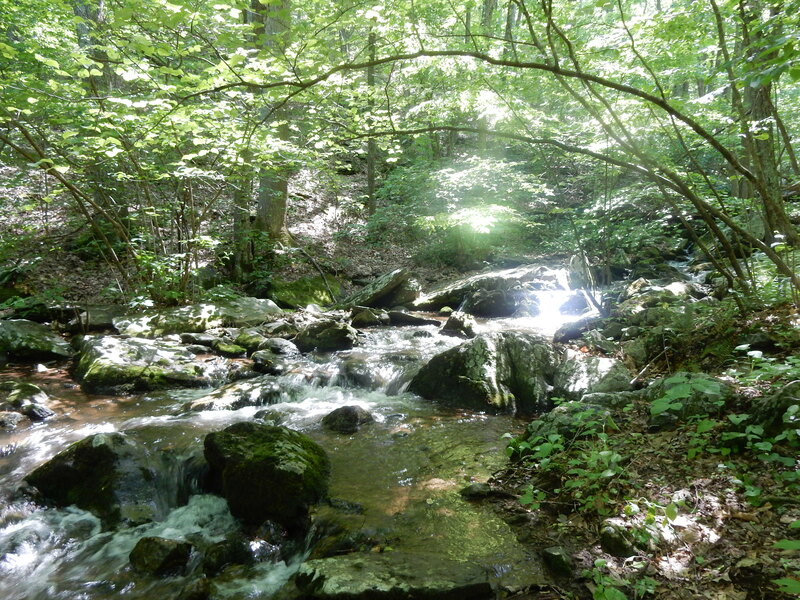 This entry was posted in Birch's Jots on Jaunts, Virginia Hikes and tagged Blue Ridge Parkway, Humpback Mountain, Paul C. Wolfe Shelter by Birch. Bookmark the permalink.